Body Builders may have massive biceps and can bench press a car, but are they actually 'strong'. Find the spiritual strength that fueled Paul to start a global movement. This powerful t-shirt may look like its been taken from a high street shop, but take a closer look and you'll find a spiritually muscular verse that will invigorate your soul and strengthen your faith. "I can do all things through Christ who strengthens me". The famous verse from Philippians that has inspired thousands has now found itself on a bright blue t-shirt, and will surely go on to inspire thousands more. T-Shirt Text: Be Strong. I can do all things through Christ who strengthens me. Philippians. 4:13, be strong in the Lord (inside the badge). Be Strong T Shirt: Blue, Adult Large was published by Kerusso in September 2012 and is our 11920th best seller. The ISBN for Be Strong T Shirt: Blue, Adult Large is APT1187LG. Be the first to review Be Strong T Shirt: Blue, Adult Large! Got a question? No problem! 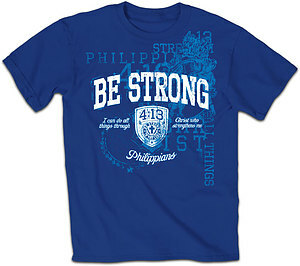 Just click here to ask us about Be Strong T Shirt: Blue, Adult Large.